On March 10th, our NY EDU sessions continue with a special seminar on hearing health. 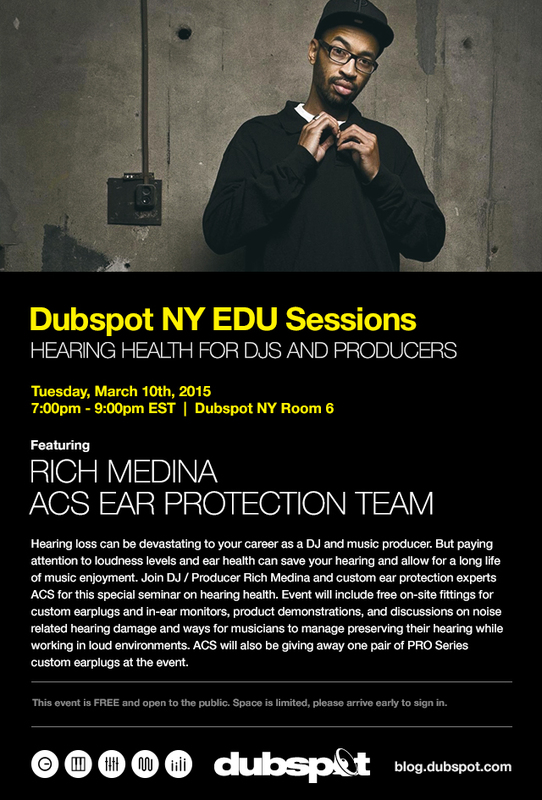 Join DJ / Producer Rich Medina and ACS Custom Ear Protection Team and learn how musicians can preserve their hearing. Hearing loss can be devastating to your career as a DJ and music producer. But paying attention to loudness levels and ear health can save your hearing and allow for a long life of music enjoyment. Join DJ / Producer Rich Medina and custom ear protection experts ACS for this special seminar on hearing health. Event will include free on-site fittings for custom earplugs and in-ear monitors, product demonstrations, and discussions on noise-related hearing damage and ways for musicians to manage preserving their hearing while working in loud environments. ACS will also be giving away one pair of PRO Series custom earplugs at the event.